The third greatest loss of life in New Zealand waters was the wreck of the Union Steam Ship Company steamer Wairarapa. This montage by David Alexander De Maus records the event. 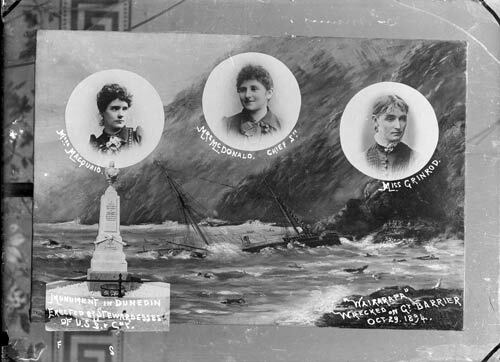 Superimposed on a painting by E. B. Hayward are photographs of three stewardesses who died and an image of the memorial erected by stewardesses of the Union Company. Bound for Auckland from Sydney, the ship ran onto rocks at Great Barrier Island on 29 October 1894. There was a heavy sea and thick fog. Lifeboats and rafts were launched, but many people were swept off the decks by the waves. The next morning a steward swam a line to shore and passengers were hauled through the water. Survivors huddled on the rocks for over 30 hours before being rescued by Māori. In all, 101 of the 186 passengers and 20 of the crew of 65 died.